Is it really the middle of June, the year half over and the month too? I swear as my kids get older time really is starting to go faster and faster. Is that even possible? My 3 year old and 1 year old will soon be 2 and 4 instead in the next few weeks and it just feels weird to say that out loud. This month has been no different then the last few ones with everyday jam packed. I am looking forward to being in America in a week’s time and putting my feet up with all my family around me. To say I am excited doesn’t even come close to describing being back home for so long. B and MM are still as tight as ever. They couldn’t be better partner’s in crime if they tried. Lately, I have been feeling overwhelmed with all that we have going on and these two just seem to be ganging up on Mommy lately too which has been tough. I guess I should be so grateful that they aren’t ganging up on each other and fighting but I think sometimes it’s just as hard when they are being naughty and not listening together. I usually can take them on with patience but that’s been lacking too and so the last few weeks I will admit for the first time since I had MM have been really hard. I have been lucky to have had it easy with them for so long, so I am hoping this is just a little phase as they both just seem to want to cry together all the time. If one cries the other is crying too for no reason at all. You may think cute that the other one is getting upset for sympathy but not so cute when you are trying to get things done and you have two wailing toddlers on your hands. It’s June and the sun is finally starting to come out to play. Maybe Mother Nature got her memo finally. So it’s easier on the days the sun is high in the sky, warming our backs while the kids splash around in their paddling pools in the back yard. I have noticed that my children are definitely outdoor kids. They laugh more, smile more, cry less and have so much fun outside and it’s only on the days we are confined to the same four walls do they get restless and become tough sometimes. So we did what everyone does when the sun shines and pulled out the paddling pools and filled them up with the hose for the kids to cool off and have a splash. I thought at first the hose water would be too cold for them but they didn’t even blink at it. They both have their own paddling pools only because they are small and I didn’t think they would fit in the same one. Time and time again you can find them in the same one playing some made up game of B’s together. 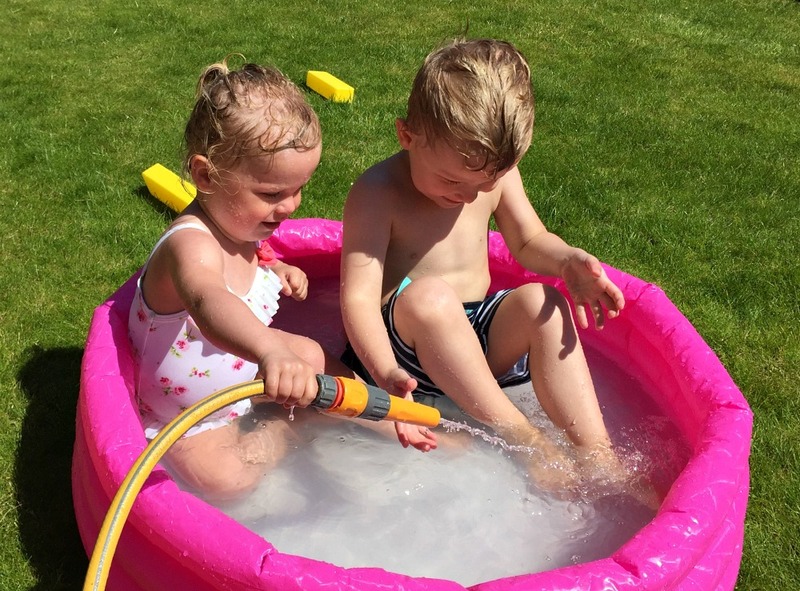 It is cute to watch them squish into the same paddling pool instead of staying in their very own. This month MM has really started talking and many things changing for her right down to her voice. She is becoming a little girl right before my very eyes. B is really understanding that she isn’t a baby anymore and he is constantly asking if he can take her to school with him in September (too sweet). I hope that starting school doesn’t put a stop to how close they are and how much they are alike. They truly like all the same things and look alike at the same age and all the milestones come at the same age too. It’s like having the female version of B in MM. I think when he starts school since he won’t be there to be his shadow anymore she will start to think for herself, like things for herself and not just copy her brother. I will be curious to see if they stay so alike or if it completely changes. Sometimes I watch them from a distance and think of how me and my brother were as kids. Even though I would say me and my brother are so close, B and MM definitely have a tighter bond earlier on together. I am so grateful for that and I think it’s the age gap is a little closer by a year than my brother and I. That one year can make such a big different I think. If I was ever to have a third I don’t know how the dynamics would change having B and MM so close and be so close and then a third in the mix. I like to think they would be amazing protective duo siblings to their little sibling if they ever get one. B loves using his imagination and making up stories for MM and I can see she just follows along with him and thinks so highly of him. Lately, they want to hold hands when we get out of the car instead of one on each side of me. I think it’s so bittersweet even though that usually means one doesn’t want Mommy anymore. We are coming to a time that needing Mommy is less and less and wanting each other is more and more. I know they love me to pieces but you want them to stay little and need you for a little longer sometimes. They prefer to play in their rooms without Mommy now and keep each other entertained and I try to come in sometimes and build blocks or legos with them and they tell me they are playing together instead. I take the hint and leave them to it glad that they have each other. B is becoming very aware of the camera in the last few weeks and wanting to hide. While MM is becoming more of the camera diva and trying to steal the spotlight. I thought it was cute when they were laying on their towels after swimming and cuddling up together to dry off. They both were hiding from me under the towels but I said, “say cheese” out of the blue MM popped her head out and smiled. haha I couldn’t stop laughing. All the while, B remained hidden. I will always respect them if they say they don’t want photos taken or to participate if we are doing something. But it is nice that MM really does love her photo taken. Easier for me and nice to grab smiling photos of her candid or not. I think she knows she is cute which is great now but oh dear in the future I am in for it. So June is flying by and we will be ending it in the states. Even though only a month has passed since the last Siblings’ update I think my two have changed so much. They have become more emotional, and showing more of their feelings. They understand sorry and hugs after a fight. They are helping more when I do laundry or dishes and wanting to get involved around the house which is amazing. They feel for each other and worry for the other one now too. It’s crazy how they can change so much at this age both separately and together. These are lovely photos. It’s amazing to see them changing month by month. Loving the paddling pools! Thanks Laura. Oh yes I think they love them too. It’s nice to get out in the sun for once with them. Can’t wait for America where we can do it everyday. They really are changing so much lately. Life really is so much easier when you can get outside isn’t it! 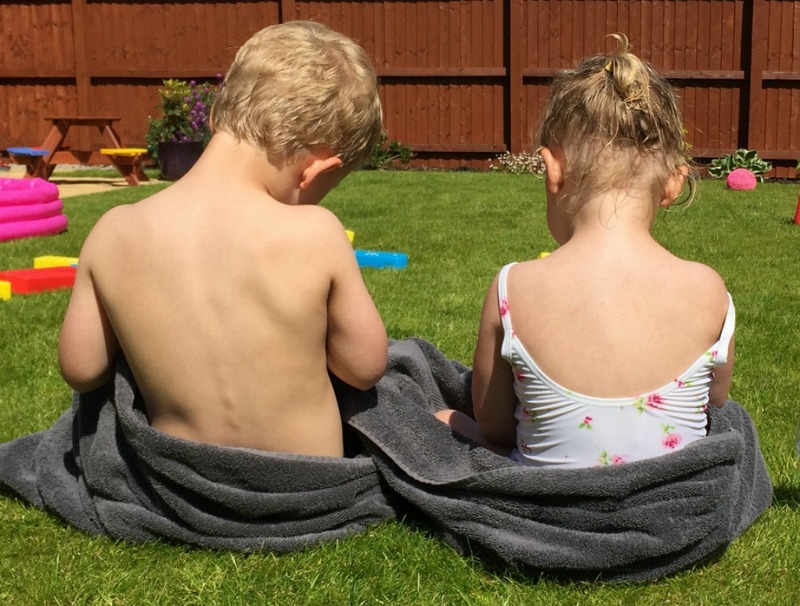 They look like they’re having lots of fun in the paddling pools and I love the picture of them hiding under the towels – or not hiding as the case may be – just too funny! It really is I think with little ones on our hands for sure. The sun just makes everything not seem as hard. lol They really had a great time wish it was more often hot enough for days like that. So cute how they decided to share paddling pools rather than staying in their own! You must be looking forward to your trip to the States when they can be outside all the time and hopefully you get some relaxation time. Oh I know I couldn’t believe it. I didn’t even think they could fit in one. lol Funny enough they did. I can’t wait for next week and to be HOME HOME. Thank you. They love them but funny enough usually only sit together in one. Makes me laugh so hard. We got one lucky day but haven’t been that many to do it more often. Mine surprised me for sure I thought there would be more fighting between them than ganging up on mommy. lol It really is great once they start playing together. Such a sweet post. It drives me nuts when I tell one kid not to do something and all the others start copying them. Can’t imagine having that at home too. Nice though that they get along so well. Have a lovely trip in the States! Thanks hun we can’t wait. Yes I always wanted them to be a team until it started being against me hahaha Typical catchh 22 isn’t it but they really do get along so well. Your two look so close, it’s just lovely to see the photos of them growing up together and their bond must be something special to watch. Here’s hoping to more summery days, although of course I assume you will have plenty when you head home! Thanks Rachel, it really is and they have so much fun together and just love ganging up on me lately and I can’t imagine them both as teenagers I will really have my hands full. lol Oh yes lots of summer days ahead of me for sure. Oh me too. I hate not having patience and I usually am the queen of it with my kids but lately my lists are a bit overwhelming. Can’t wait for relaxing in America. Thanks Aby. It was nice to finally have some sun here in england hot enough for them to play out and swim. They light up when they can be in water outdoors. It’s amazing watching them together and I only wish someday to have a third to join the crew. It makes the world of difference when they can run and be free in the fresh air for both them and me. It really is hard when they all cry but you have your hands full more than I do so I can’t really say much. lol You are amazing. I can’t wait to be home and be with family and in the sunshine. That’s one of the reasons I am so excited to go home this year as MM is older and will have so much more fun there this time. It’s amazing how much they change from day to day, week to week. Just yesterday my wife sent me a photo while at work, and instead of being a two year old, he looke five! Before I know it he will be off into the big wide world and starting his own family. It really is, at this age you go away for a day and they seem different. It’s mind blowing sometimes. I know it’s tearful to that how quick it goes. Definitely amazing to have siblings but nothing wrong with only children either. Sad that people don’t get on with siblings. I am from a huge family but we are all really close and I am so grateful for that as I know my hubby only has one sibling and they will never speak again so sad. You can’t guarantee anything can you? It’s nice when they team up just not so nice when it’s against mommy. lol They are a great duo though. So lovely to watch them grow together. Most times I’m okay and have accepted that I’m fine with having just one child. But when I see photos like these, makes me wish I could give my little T a sibling too! Such precious photos 🙂 #sharewithme. Oh bless you. Thank you so much. Thank you darling. It was the perfect day out in the sun wish we had more of them lately. I love this stage where they can do the same things and be entertained together. Thank you Jemma. They do get along so well its just the whiny and crying they do together that gets tough. Never thought about it before, always thought I would have to break up them fighting instead. Boy was I wrong. Thank you. It really was a lovely day and just what we all needed for fresh air and space to run around and play free. It Always looks very cute when they team up together. But I get that it isn’t Always best for mum. Here it’s the same. :-) It’s amazing how they can bond. When little R was born, T instantly was protective and very sweet to her. he’d take care of her and as soon as she could, she would follow him everywhere. Thank you Julia. I am very grateful they get along well. That’s fantastic yours are close with an age gap. I have older siblings that have huge age gaps but we are still close too. Thanks we can’t wait for the states. 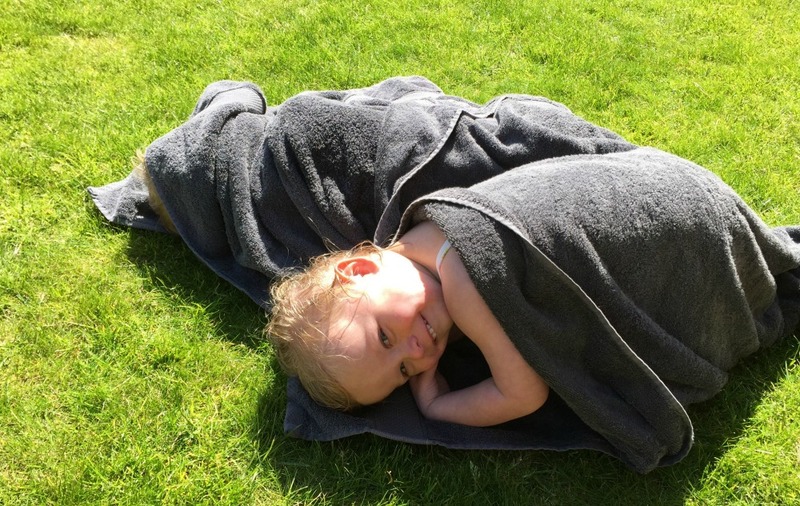 HAve a great time in the States and lovely prose about your kids – I love the pic of them in the paddling pools! Thank you Talya so sweet of you to say. They are so fun to watch bonding together from a far. I try to give them space and just enjoy it. time really does fly by, doesn’t it? Its wonderful that your children are getting so close. It does indeed Jeremy. I am very grateful for it. That’s for sure. Thanks Debbie. They are fun at this stage even if a bit of a handful love watching them bond together. 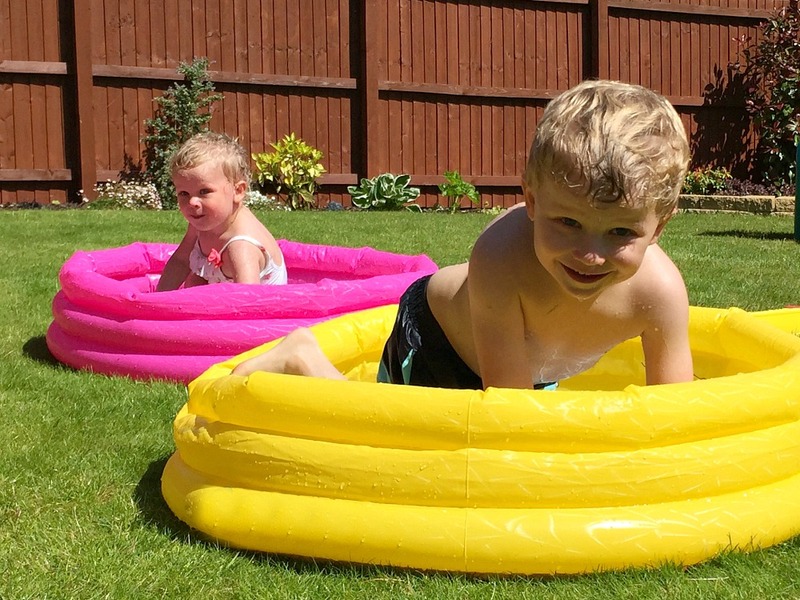 I love the cute little matching paddling pools – it looks like they are having fun! Thanks Ali although I didn’t really need to buy two just one as they kept sharing anyways even though they didn’t really fit in one together. hahaha Typical isn’t it? I hope you are so right hunny and that just made me feel a whole lot better about it all thank you. Ahh that is sweet. I can’t wait. You always have such great pictures and wonderful stories! I love that your children are so close with each other! I totally get what you mean, as much as we want our children to be independent, it’s a little hard to swallow sometimes when they are! Oh they are so gorgeous, Jenny! You can really see their bond coming through in those pictures. We need more paddling pool weather don’t we? What’s going on?! Hope you have a fab time celebrating their birthdays. Thank you Jenna. It’s great to see on photos them bonding together and saving these memories they may not remember themselves at this age. Thanks we can’t wait for the double birthday features coming soon. Thank you Michelle. 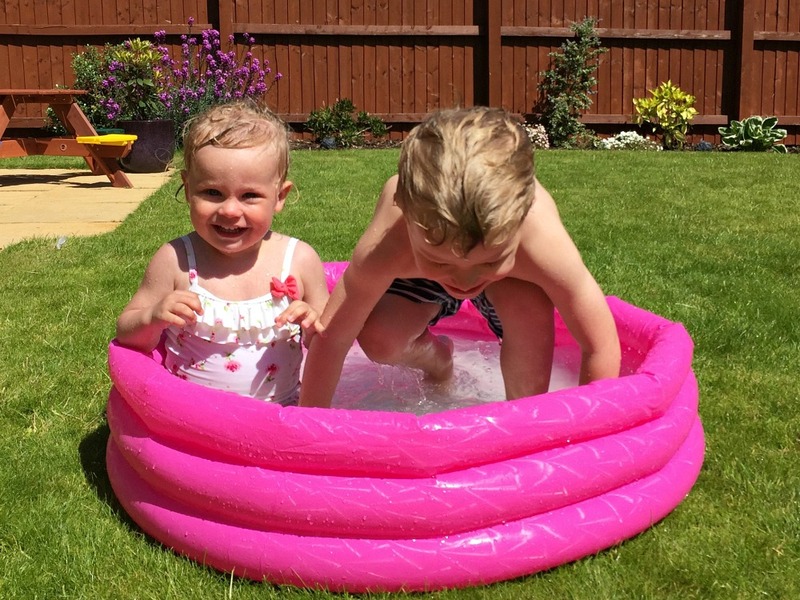 Just wish we had more “paddling pool days” here in the UK but we are off to find the sun in the states again this summer so can’t complain too much. Thanks again. Lovely pics and so nice seeing and hearing how they’re changing. Especially with me only having N, it’s interesting to see how dynamics might have changed if we’d had a second. Hope you have a great time back in the US. Thank you Emma they are changing SOOO much lately and the bond is just getting closer and stronger and I am forever grateful for that I worry sometimes how school will change it all. We shall see. We will have the best time promise….usa is always full of sun family and fun. It’s always great when families stay close and can grow up together and share their own families together too someday. Thank you. Thank you Becky I think so too but I am so very bias. lol It was great for them to get out in the fresh air and have time to play and run around without breaking the house up on a rainy day. lol Its great to have them so close together isn’t it? You have captured such special moments. A beautiful post and fantastic future memories for your family. Really warmly written. Thank you Catie. I think my favorite moments is when they know or think I am not watching and using my zoom in so they can just be candid real photos. Those are always my favorite. Thanks hunny. Lovely that the two of them are bonding. You can tell from the pictures that they adore each other are just super close. I hope everything is getting better with them and that the naughty phase is slowly passing. A string of patience goes a long way, so hang in there, mama. Thanks for hosting us this week with #sharewithme, Jenny. Wishing you a great evening! Thanks Maria. I love trying to catch them when they are in their element and don’t realize I am taking photos. Always seems to be the favorites and the most smiley happy photos. I could do with a magic wand for patience but I also know this little phase will soon be over when B starts school and I will be wishing it wasn’t over so I am sucking it up as my momma would say. The sibling relationship can be so wonderful. They can be allies through life even though at times they just wont get on. It is amazing watching our children grow. I found it at once wonderful and sad when mine didn’t need me so much. Like you I find it strange when they have a birthday and then sometimes forget to refer to their actual age. It really is amazing to watch and I should have known it would be amazing to watch them as I think it’s amazing to be so close to my own but being the parent watching it is bittersweet for sure. Thanks hun. Yes just around the corner can’t wait for it. Neither can the kids I think. Oh yes somedays are tough but I wouldn’t want it any other way they are so close and bond so much lately and it’s amazing to watch. Such beautiful bright summery pictures, I love. Thank you Kara you are too sweet to us. I love catching them when they don’t know I have the camera out and just candid photos of their excitement and happiness. Oh yes don’t you worry I am sad that they are getting more grown up so quickly but a hot coffee taste so good I almost forgot how good. lol They are great together and I think age gap doesn’t always matter I am super close to my brother who is 14 years older than me and a brother that is 3 years older than me. So it terms of age I think it’s just about the relationship they form and bond throughout the years of growing up. My body clock is so slow I am still thinking its may! Thank you Suzanne. I know I am trying to capture them as much as possible it’s not long before he will be in school all day. Bless. Milestones are flying by. Oh that’s amazing they have bonded so well. Welcome to the blog hop and so glad to hear you are loving it. I also run one every Wednesday to Tuesday night so if you ever fancy sharing any post, old or new keep a look out for Share With Me, one just opened up now. Don’t forget to tweet me your url and hashtag #sharewithme and I will promise to retweet to my followers. Siblings is also a great one and Lucy runs another one called Me & Mine for family captures which is amazing too. Hope to see you there.